Great wine. Our pursuit of this ideal has shown us the importance of organic and biodynamic viticulture. It has instilled in us a respect for the soil, water and ecosystems upon which great wine, and our planet, relies. From the beginning, we sought to provide a good example of what is possible in Ontario, and to pursue certification to back it up. So went the thinking behind our vision for Southbrook Vineyards. The soil beneath our feet was perfect for the vines we wished to cultivate. Better still, it had lain fallow for countless years before planting, thereby offering the clean slate we’d hoped for. Thus did Southbrook set out to prove that biodynamic, organic and other green initiatives can work in an Ontario vineyard. Our certifications include: Demeter, Pro-Cert Organic, LEED® (Leadership in Energy and Environmental Design), Sustainable Winemaking Ontario, LFP (Local Food Plus), VQA (Vintners Quality Alliance) for grape wines, and QC (Quality Certified) for fruit wines. Organic agriculture uses natural inputs. It uses less water, less energy, no synthetic pesticides, no chemical fertilizer, no bioengineering, and no genetic modification. Organic agriculture results in more biodiversity, conserves more water, and improves soil health. 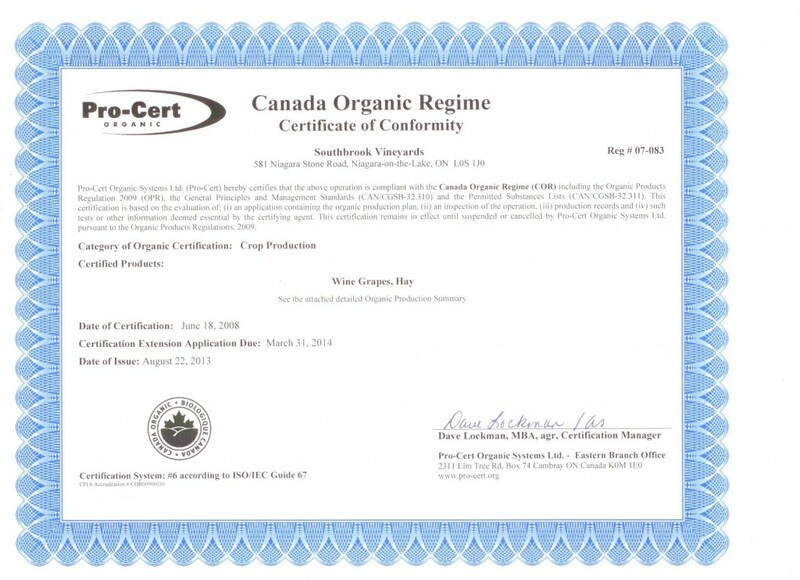 Southbrook’s first 75 acres were certified by Pro-Cert Organic Systems Ltd. (then OC/PRO Canada) in 2008. Our entire 150-acre property is now certified organic, including the hay and our sheep. Organic certification is a pre-requisite for biodynamic certification. Biodynamics (BD) emphasizes the balance and interrelationship of a farm’s soil, plants and animals to grow low-impact, vibrant crops, including grapes. It treats the whole farm as a single living entity. BD involves the use of specially prepared composts, the addition of ingredients such as herbal teas, and the alignment of farming activities with lunar energy. Demeter is the international body that oversees biodynamic agriculture. 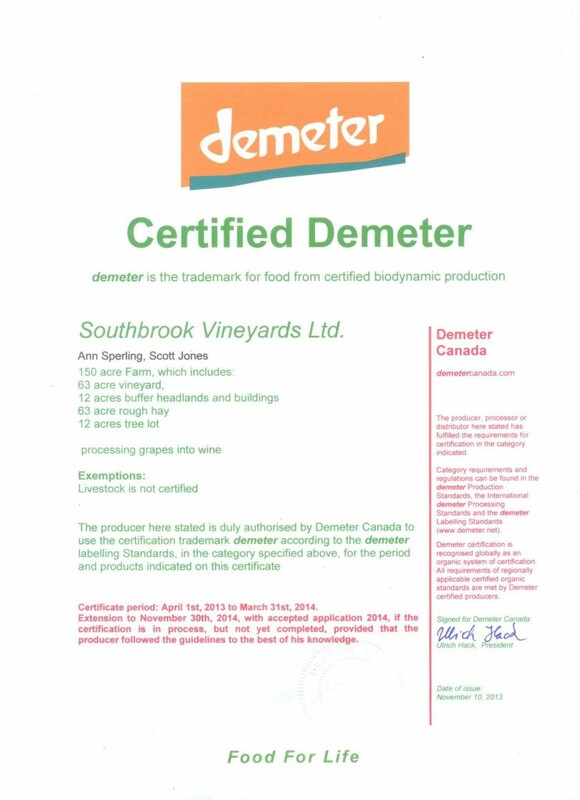 Southbrook currently has one Demeter-certified biodynamic 75-acre vineyard (2008), plus an additional 75-acre property with full biodynamic status. Other significant Demeter-certified wineries include Domaine Zind-Humbrecht in Alsace, Coulée de Serrant in the Loire Valley and Benziger Family Winery in California. Southbrook’s hospitality pavilion became the first winery building to receive the Gold level of LEED® (Leadership in Energy and Environmental Design) from the Canada Green Building Council (CaGBC) in November 2008. Achieving LEED® Gold certification for our buildings and activities was always a significant component of the Southbrook master plan. Diamond & Schmitt Architects truly rose to the occasion with its design for our winery, hospitality pavilion and surrounding works. Natural light prevails in the hospitality pavilion, while the floor-to-ceiling double-glazing controls temperature transfer. Walls are thoroughly insulated, and deep roof overhangs give added shade to the building. Indoor water usage is controlled by automatic and low-flow fixtures. Externally, we added a bioswale with native wetland plants to break down pollution from stormwater draining off our access road and parking lots. See our "Green Map" (pictured above) in more detail (pdf). We are committed to producing our table wines and Icewines from grapes grown in Ontario. Our fruit wines are made from all-Ontario fruit also. The VQA logo or appellation on the label is your guarantee as VQA always means 100% Ontario grapes. We believe in giving back to the community — and helping the community help itself. Through donations of facilities, labour and wine, Southbrook committed tens of thousands of dollars last year to charity. Our owners and management also actively support important industry organizations by assuming board and other leadership positions. Our certification by Local Food Plus is another Southbrook initiative. Non-profit LFP certifies local sustainable food producers that adopt green, responsible business practices. These include operating sustainable production systems, ensuring safe and fair conditions for workers, protecting wildlife habitat, conserving energy and cutting greenhouse gases. Wine Country Ontario has developed best-practice guidelines in a program called Sustainable Winemaking Ontario. It covers aspects from viticulture and waste water management on the farm to efficient energy usage in all winery operations. Southbrook has achieved the requirements of this “from soil to shelf” program to support the industry’s efforts to help sustain Ontario’s success on the world stage. We have taken the responsibility to engage fully in a sustainable program here at Southbrook. The example of winning certifications like LFP, LEED® Gold, and those acknowledging our biodynamic and organic techniques, are some of the ripples that our initiatives send out. If these examples serve to inspire others to make a commitment for themselves, then we are very happy, as their ripples will motivate more people as well.